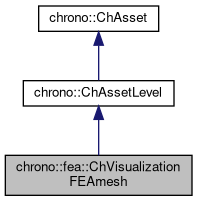 Class for a FEA mesh visualization. It converts tetrahedrons, etc. into a colored triangle mesh asset of class ChTriangleMeshShape that is contained in its sublevel, so that it can be rendered or postprocessed. Set the resolution of beam triangulated drawing, along direction of beam. Set the resolution of shell triangulated drawing. Access to the list of children assets. Get the Nth asset in list. Set the resolution of beam triangulated drawing, along the section (i.e. Updates all children assets, if any. Overrides default behaviour that does nothing. Note that when calls Update() on children assets, their 'coords' will be the result of concatenating this frame csys and 'coords'.